The Finca Bellavista Tree House Inn/Resort in Costa Rica! Wow....I don't really even need to say anything here! 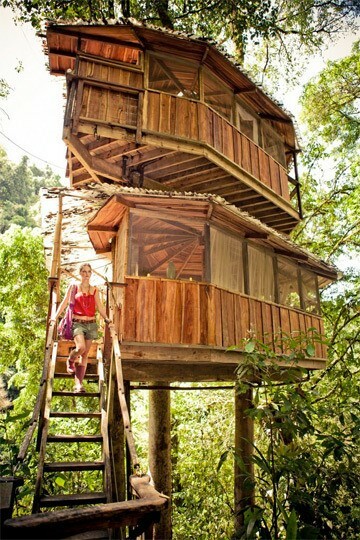 I've stayed in a few amazing treehouses in the past, and this one looks like it would certainly rank right up there!!!! 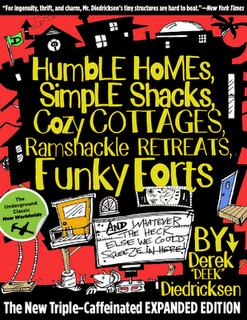 You'll be seeing alot of tree houses and tree forts coming up, as I'm in search of them, photos, and builders, for an upcoming book I'm working on for a publisher- it'll be a very loose follow-up to my current book "Humble Homes, Simple Shacks". If you have any photos, or have built one- email me at kidcedar@gmail.com. Girl Power! 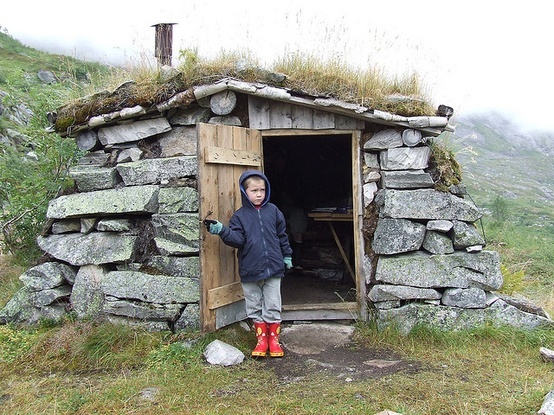 A really cool shack/fort from Tyler Rodgers! I'm 16, and I am just starting to put the finishing touches on my first tiny house. I'm really happy with it, and just wanted to say thanks for all the inspiration that your blog has provided throughout the whole process. The whole thing is about 90% salvaged materials. All of the wood except the 2x4 framing and plywood roof piece came from a dock that was being torn down in one of my friends' neighborhoods. That was where I got really lucky. So much free lumber! I bought each of the two windows from the Habitat for Humanity store for $5. 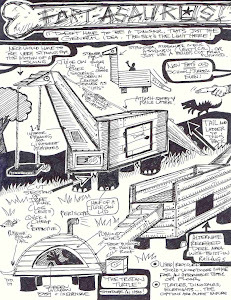 I based my design on kind of an enlarged version of your "Hickshaw" cabin, but really wanted to build in the spirit of the "Gypsy Junker", in terms of spending as little money as possible. Really, I can't say enough how much your blog has helped. It helped me realize that building a tiny house is totally doable and relatively inexpensive if you are willing to search for free materials. Building the house was great, but I also just love hanging out in it. I feel like a bunch of people believe that these kinds of structures will make them claustrophobic, but my house is now one of my favorite places to relax. After reading your post about hammocks, I bought one and hung it up, and now I can sit in it for hours and read or nap. I angled the house so that the windows would frame the view of the tidal creek next to it. I also just finished putting in a skylight, which allows in some additional light and can be opened in the Summer for more ventilation. Now I'm looking forward to caulking up all of the spaces between the boards, just to make the whole structure a little bit more water-tight. I am probably also going to add more shelves, and might paint the outside, although the unpainted look has really grown on me. Again, your blog was a tremendous help. 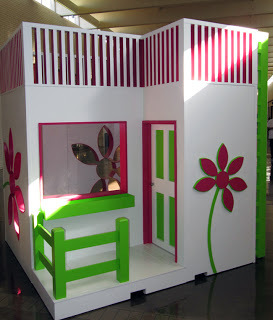 Check out this super-fun Dallas-built playhouse/clubhouse for kids- its boxy and simple, yet appears fancier and complicated upon first glance- there's an art to that! The upper level, or railed-in balcony, is nice too, although I'm not sure if you can get up there (or would want your kids too). Notice the slots near its base for forklift tines- smart. 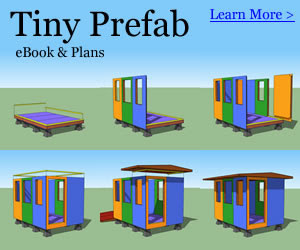 Here's something I built in a series of new designs and works towards another tiny house, shelter, playhouse, and fort book, that I've been busy with. It'll be quite some time before the book is out, but in the meantime, I've been very busy sketching, designing, and building- fun! This tiny, simple, and affordable A-frame could make for a cool little office, a backyard retreat, or even a very doable tree house, as its so light in weight. The A-frame is a little over eight feet tall, and its base is six feet wide.